Quality rammed earth walls have fantastic strength, for example a 2′ x 2′ pillar could hold the weight of a double decker bus. We test our walls to make sure that they are performing as expected and every test we have ever done has met or exceeded our engineers specifications. Experience in material selection combined with proper mix and curing procedures are the way to achieve consistent results. 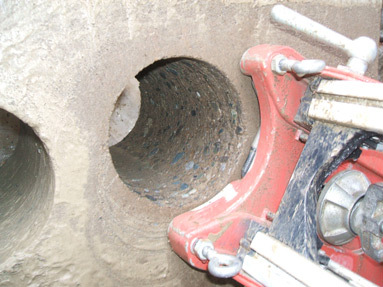 Wall testing can be done either by ramming test cylinders or by coring a finished wall. The samples are sent to a lab where crush tests are performed. 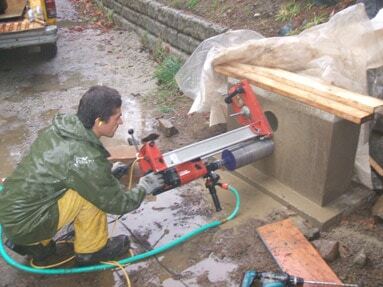 Coring a rammed earth test wall that we had built for this specific purpose. It’s always fun working in the rain! This is what the rammed earth wall looks like after the core sample has been removed. 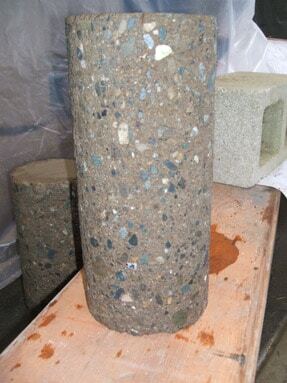 The rammed earth core sample shows the inner material much differently than the outside of the wall as the stones have been cut through. Notice how there are various particle sizes, this is a characteristic of a good mix. Having a good particle size distribution allows the material to be compacted better, leading to a higher quality wall. The raw material for building rammed earth walls can be sourced locally almost anywhere. This is the local gravel pit, when this picture was taken the house we were building was only about 2 km away. 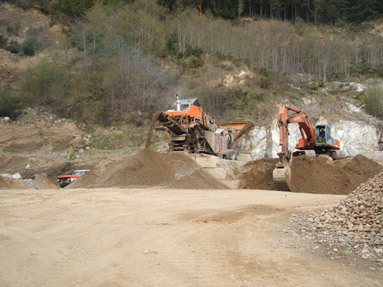 The raw material is loaded into the crusher that crushes the larger rocks and screens the mix to a diameter of 3/4″ or less. The sand and smaller percentage of finely distributed silt and clay are naturally occurring and already mixed in with the stone.